PanARMENIAN.Net - Indian researchers have discovered a new species of frog - in a roadside puddle, the BBC reports. 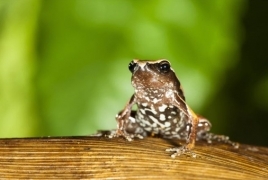 "Our discovery of this new frog genus from one of the most explored and researched regions in the Western Ghats indicates that documentation of amphibians in this globally recognised biodiversity hotspot is still far from being complete," says Sonali Garg. "This frog went unnoticed until now probably because it appears for less than four days for breeding activities and lives a secretive lifestyle for the rest of the year."